I love my car, when it drives me from A to B. I I fill it with petrol, wrestle with an air pump for its tyres and occasionally pour in a glug of oil; but that's the limit of our relationship. However, i haven't a clue what to do when my car's performance becomes sluggish or if a light bulb has blown! The truth is I just don't have the intricate technical knowledge of my most trusted steed. As a woman, there's added pressure to this dilemma: Which garage do I trust and will I need to bring my brother with me, again, so that he can barter the price down? I don't need to worry though because there's a new business in town and the name is MR T Autos. Don't “be no fool” with the name, as there is no tough-talking, gold,jewellery- wearing, maverick attitude here. Instead, MR T, himself, is Andy Thurgood, a garage owner with a big, generous reputation in Maidenhead. MR T Autos is his new enterprise offering drivers of all makes and models a one stop- shop for car servicing, MOTs and repairs. From the moment you drive your car to Unit 4, Andy's honest and straightforward character takes over the business of getting your car ready for the road. His qualified team of mechanics can help you with any aspect of your car: from replacing the windscreen and tyres to body and paint work, all in his new base in Cordwallis Commercials in Cordwallis Street. 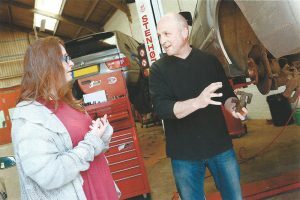 Andy has an envious motoring CV that involves working on commercial and private vehicles, from the pit stop of the racing track up to after-sales management and co- founder of Six Bays. But, why should I, or more to the point you, trust this mechanic? Knowing we all want to avoid the bills on our four wheels, particularly the expensive ones that most garages like to shock us with; Andy, would much rather talk sensibly about the work, assess it with your lifestyle and driving usage, and effectively put you back in control of the spending on your car. Andy's smart philosophy is simple: put the driver in the seat of spending control. His informative style certainly put my anxiety to rest. “We'll talk through the proposed work, in everyday language,” continues Andy, “and we'll agree the expenditure, and show you the work we've done afterwards, to make sure you're entirely satisfied." I was completely satisfied as the result of his careful SO-point health check on my car reveals there are a few points that need to be addressed including my front brake discs and corrosion on my rear springs. He gave me a price and an expected time to work on these focus points. All very reasonably priced and something I can budget towards over the next few weeks. One customer, who has moved his business to MR T Autos, knows all too clearly why he trusts Andy. Robb Gravett is a former British Touring Car Champion, who since retiring from the World-Class stage, has a highly successful business, Ultimate Car Control UK, which aims to sharpen motorists' skills through safe, driver training. Once you've got your car under control, how about learning some accident avoidance techniques with Ultimate Car Control UK? To Robb, the importance of finding a garage technician that repairs, services and improves his motors is vital. But it's not only the trust that gets Robb's thumbs up; the price is a big factor too. With Andy, there are no hidden surprises," says Robb. ”He keeps the bills down to a minimum and he keeps my custom. “l fully support Andy's new business with MR T Autos as I know his team will meet my expectation of service and budget at all times." So if you want your car to be looked after properly, you need to call in the expertise of MR T Autos. MR T Autos is your one stop-shop for car servicing, MOT s and repairs for all makes and models. Come along to our brand new workshop in Maidenhead and you'll find the same team of friendly and skilled mechanics that you love. We can help you with any aspect of your car: from replacing the windscreen and tyres to body and paint work. "It would be our pleasure to re-instate your faith and trust in the motor trade. Sounds like a big task but we will do our best."